When making a figurine out of sugar, it is best to use a combination of fondant and gumpaste to get a longer period of time to work the paste and position your figurine for drying. It will take a bit longer to dry and you will have to factor that time into your piece. 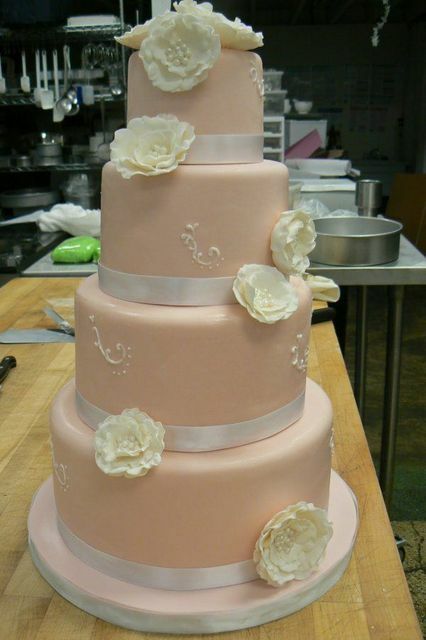 For pieces that will take a bit of time, I use 50% gumpaste blended with 50% fondant. The glue that I use is a glue made of gumpaste mixed with water. Toothpicks serve as great tools to secure arms, legs and heads to the body. The clothing and wings are made by cutting flower petals out of gumpaste..with the angel I used a tulip cutter. 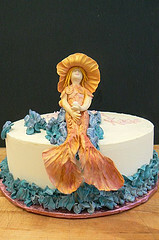 This little mermaid was made to sit off the edge of the cake, I dried the mermaid sitting off the edge of a cake pan the size of the cake to get the fins to dry the way I wanted them to dry. To obtain a great and grand tail for the mermaid, I rolled the body out of a piece of 50/50 and used scissors to cut the separation. I tooled the tail with my ball tool and the Dresden side of my veining tool to get the fine detail.. the waves are made of buttercream and this is a buttercream iced cake. It is ok to combine buttercream with sugarpaste..those old rules about not combining the two mediums are just that..old rules..they don’t apply anymore. 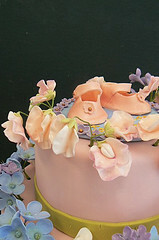 For this baby shower cake, I made the baby shoes from a template which allowed me to make them from pure gumpaste. They were allowed to dry in a natural position making them more realistic looking. I applied the shoes to a round plaque so that they could be saved by the expectant mom for as long as she wanted them. This is by far, my favorite formula for making gumpaste. The petals of flowers like the Rose can be tooled thinly but because of the egg white in this formula and the gelatin, the petals seem to be stronger than with other formulas. Remember that you do not want to overheat your gelatin. 14 seconds in the microwave should give you a temperature of about 112 degrees F . I use an infrared digital thermometer which works quickly and accurately. Dissolve the gelatin in the ¼ cup cold water. In the bowl of a heavy duty mixer, combine the CMC powder with the confectioners’ sugar until well blended. Melt the white shortening in a sauce pan over low heat. Add the corn syrup, glucose or Trimoline. Microwave the unflavored gelatin for about 14 seconds. The melted shortening blended with the corn syrup should be a temperature of about 104 degrees F before adding the microwaved and melted gelatin. Whisk this mixture well and pour into the mixer over the confectioners’ sugar. Blend with the paddle for about 20 seconds and then add the egg whites. 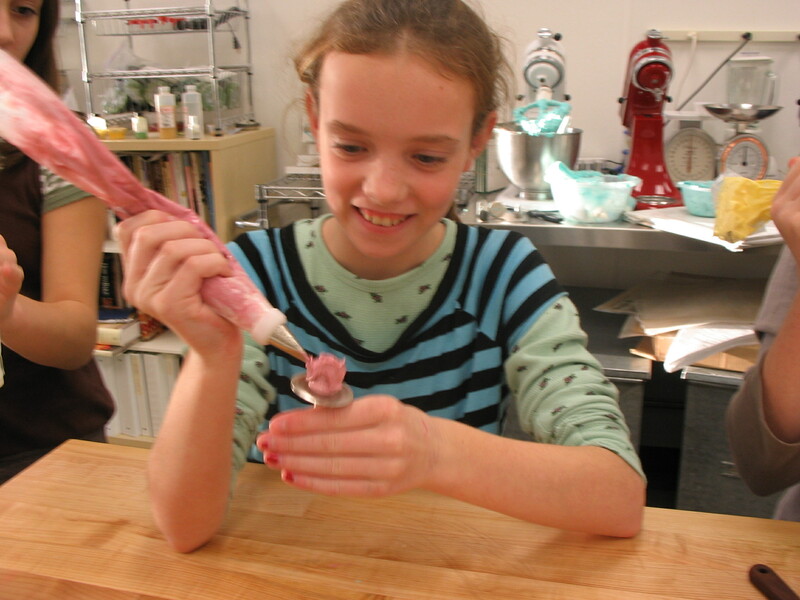 Allow the mixer to run and incorporate the liquids into the confectioners’ sugar. The mass will come together and look like a creamy thick royal icing. Allow the machine to run for a full minute so that the confectioners’ sugar absorbs all the liquid. Turn out onto a clean board that is dusted liberally with confectioners’ sugar so that you can knead the gumpaste for a few minutes. Double wrap and refrigerate for 24 hours before conditioning with white shortening. Condition the gumpaste the next day with small amounts of white shortening, warming the gumpaste in your hands and softening it into a workable paste. Double bag in ziplock storage bags and keep refrigerated. Italian meringue buttercream is my preferred buttercream for icing cake with. 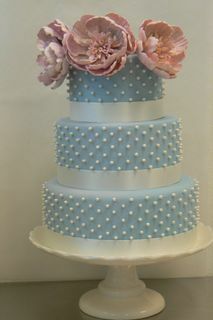 To color it, I add a small amount of Confectioner’s Sugar to it which allows the buttercream to accept food color gels. Italian meringue buttercream is made by whipping egg whites to a soft peak and then stabilizing them with granulated sugar. Pouring a hot syrup into the stabilized egg whites and whipping the whole mass to cool before adding the softened unsalted butter. Put the egg whites into the bowl of a heavy duty mixer with a whip and whip to the soft peak stage. The mechanics of whipping egg whites is the development of air bubbles that are sitting one on top of the other. As the whites whip the bubbles of air become tinier. Soft peaks will show you small bubbles of air and when you pick up the whip, the peak will fall to one side. Stiff peaks are when the whites raised on the whip will not fall at all. When your egg whites are at the soft peak stage, gradually pour in ½ of a cup of granulated sugar reserving the remaining ¾ cups of granulated sugar for the hot syrup. In a saucepan, bring the remaining ¾ cups sugar to a boil and allow it to reach a temperature of 240 degrees F. Carefully pour the hot sugar into the whipped egg whites which will have tripled in volume. The whites will be very hot and must be allowed to continue to whip which will cool them and turn this mixture into a meringue. When the whites are cooled, add the pound of unsalted butter and finally the teaspoon of vanilla. 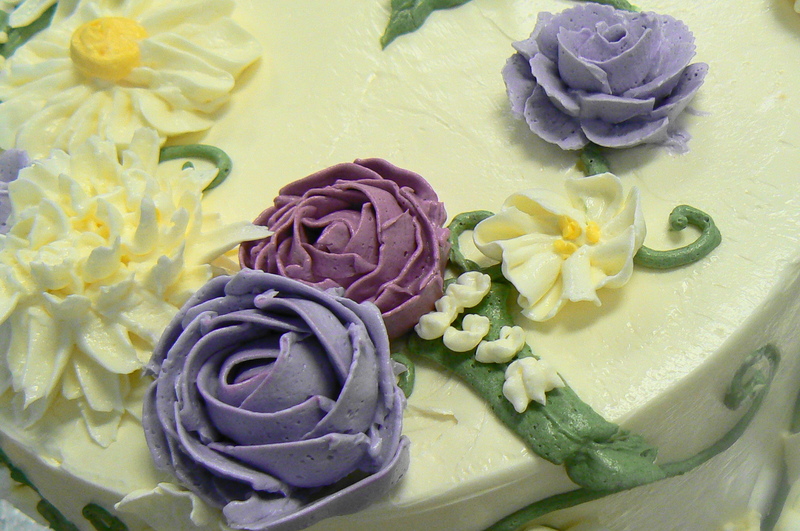 To color the buttercream, you must add confectioners’ sugar which will allow gel colors to become vivid. Never use liquid bottled color. Always use gel colors with Italian meringue buttercream. 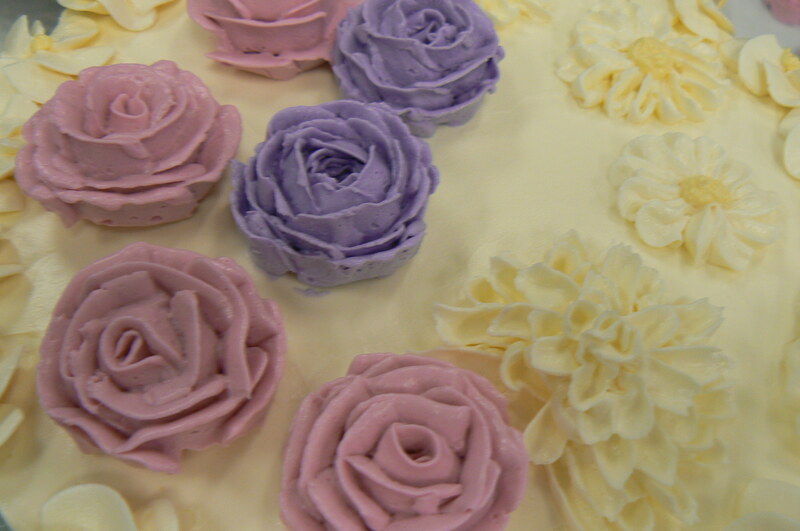 An 8 year old piping flowers with Italian meringue buttercream. Mastering the techniques does not take long. It can be accomplished rather quickly. 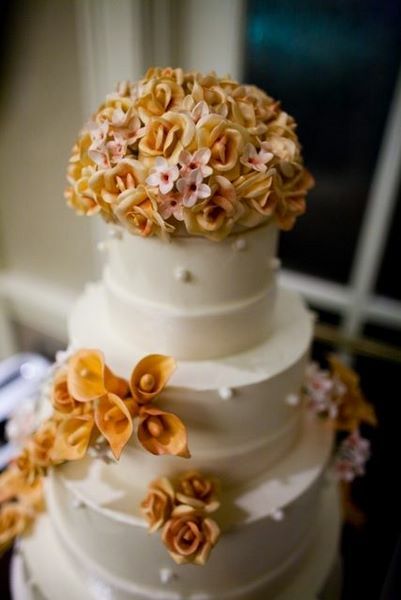 When you first start to pipe buttercream flowers, it will feel awkward because you are using muscles in your hands and arms that you do not ordinarily use. Part of the process in learning to pipe buttercream flowers is to build those muscles with repeated use and to create muscle memory. Eye hand coordination is also developed in this process. Remember to do a bit of piping over a period of days for the quickest results. You will actually be processing the piping techniques in your sleep and over time, your piping will improve. It is always best to crumb coat the outside of the cake that is to be decorated. 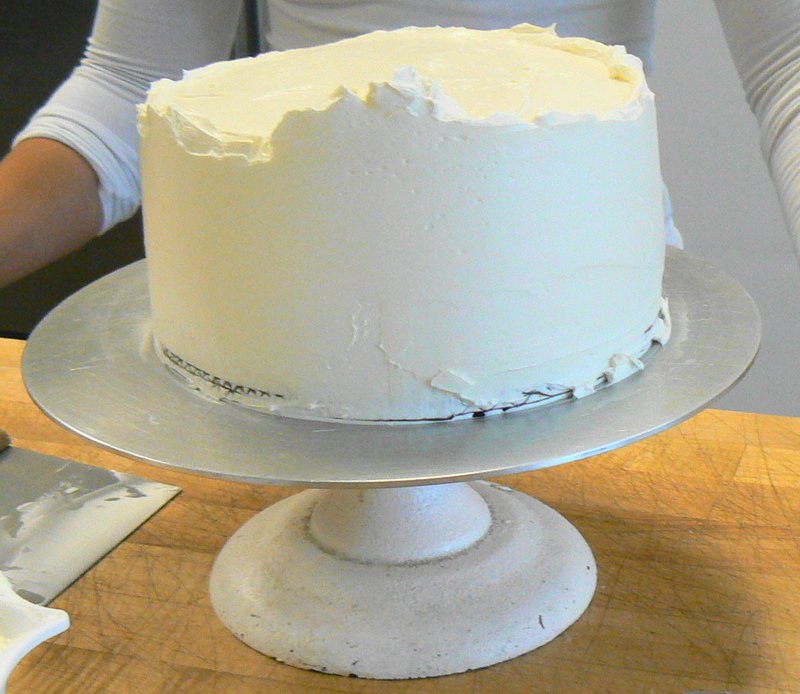 Smooth layers of buttercream are best added a layer at a time. 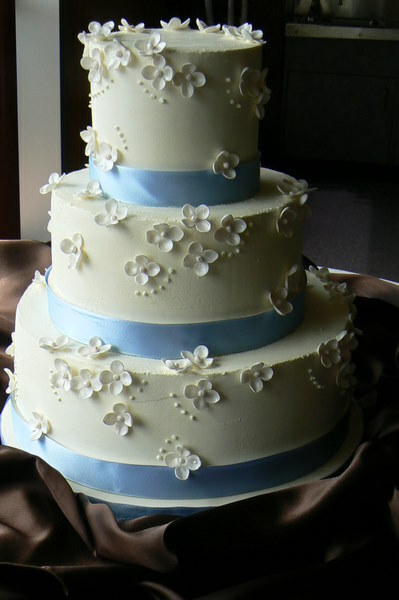 The first application of buttercream on a raw cake is called the crumb coat. Masking the cakes requires a couple of smooth coats of buttercream. When I teach buttercream piping, I always start with the rose as that is a challenging flower for people to learn and master. After accomplishing the rose, the remaining flowers are rather easy to learn to pipe. It is helpful to know what kind of tips to use to pipe the various flowers. It is always nice to have your tools and equipment perform a couple of functions. Ateco has so kindly placed this beautiful photo of tips on the web and if you don’t know which tips to purchase, go to the Ateco website and study the kinds of tips you can use. 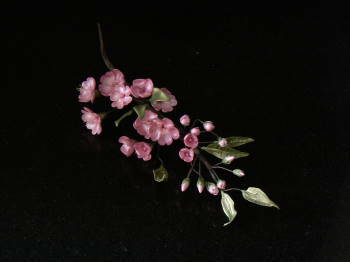 The flowers above are made with a curved tip #61 which will also make a beautiful cupped blossom. Dots are made with round tips of various sizes from #1, #2, #3 on up to #12 which will make a beautiful pearl dot border. Become familiar with the tips, their shapes and what they can do for you. Experiment and practice each day until you feel comfortable holding a piping bag and applying the amount of pressure on the bag necessary to pipe beautiful flowers and leaves. Before we know it, Autumn will be here and Autumn in the Pacific Northwest means Spice Cake. If you have the opportunity to use Vietnamese cinnamon, do so. You will be delighted with the flavor. Prepare 3 – 8″ cake pans with plenty of pan release and rounds of parchment paper. Preheat the oven to 350 degrees f.
Make sure you cream the butter and the sugar very well. People have a tendency not to cream the butter and sugar enough. When butter and sugar are well creamed together, they will lighten in color and be very fluffy. This is because you are “dissolving” the sugar into the fat and the action of mixing these ingredients means the sugar will be acting as an abrasive. Beat well after each addition of an egg. Scrape down the bowl. Start with a third of the dry ingredients into the mixing bowl followed by 3/4 cups of the buttermilk and alternate until all the buttermilk and dry ingredients are used. Scrape down the bowl and the paddle well and blend until just incorporate. Do not overmix. Divide evenly between the three 8″ cake pans and bake for about 25 minutes at 350 degrees f. When the cakes are just becoming light brown and the center springs back when touched, remove from the oven and allow to cool for at least 20 minutes. Remove the cakes from the cake pans and invert them on top of the bottom of the cake pans to cool completely. Chill thoroughly in the refrigerator before filling. Blackberry Mousse is a hands down winner of a filling for this spice cake and is just so Pacific Northwest. A good cream cheese filling would be nice or a mascarpone cream filling with fresh blackberries even nicer…!! Nothing says wedding more than White Cake. However, white cakes can be tricky if you are a person challenged by folding whipped egg whites into a cake batter which is the case with many a white cake recipe. The best way to make white cake is to use the egg whites as if they were ordinary eggs and add them as you would a whole egg..just add the egg whites a little at a time. Prepare 3 – 10″ cake pans with parchment rounds and plenty of pan release. Sift the flour, baking powder and salt together and set aside. Cream the unsalted butter, vegetable oil and sugar together until they are very light and fluffy. Add the egg whites a little at a time. Add the vanilla extract. Alternate the dry ingredients with the milk in thirds. Do not over mix or tunneling may occur. Divide evenly into your cake pans and bake for about 25 and test with a toothpick to make sure the cakes are baked through the center. Remove from the oven and cool at least 15 to 20 minutes in the cake pans before removing from the cake pans. Invert the pans and finish cooling the cake layers on top of the bottom of the pans before chilling them thoroughly in the refrigerator. This cake is excellent filled with fresh Strawberry Mousse (see Fillings in categories), or Chocolate Mousse, or Bavarian Cream with fresh fruit. I love it with Lemon Cream and fresh blueberries. Use your imagination and begin to visualize good combinations of flavors and textures. To make an orange cake, simply add a Tablespoon of grated orange rind and a teaspoon or two of Hero Orange Compound.